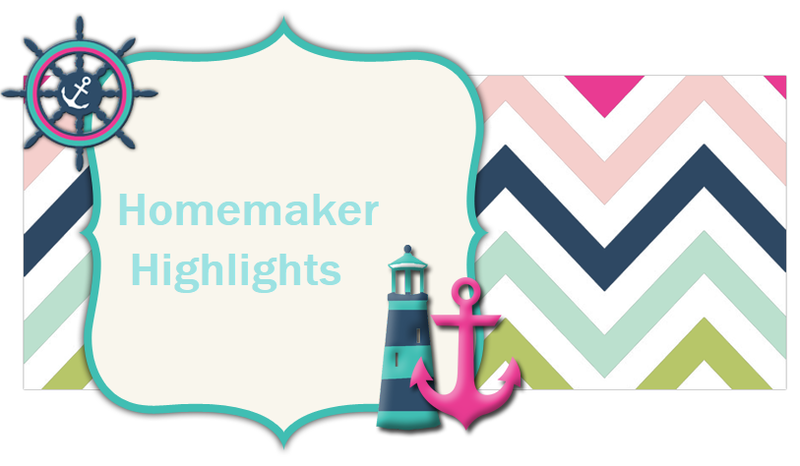 Homemaker Highlights: Frugal Under 10.00 Garden Makeover. Frugal Under 10.00 Garden Makeover. 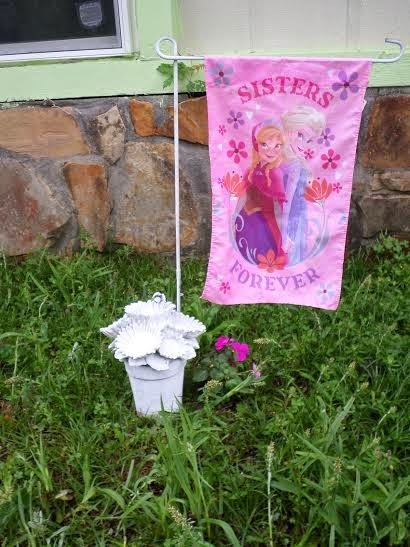 This is the flower garden in front of our house, A.K.A The weed pit. When we purchased our home over ten years ago, we thought this area had so much potential. Originally, it was lined with azalea bushes that were so beautiful when in bloom. Unfortunately, every year the bushes brought with them lots of little caterpillar type worms. We would be coated with them by merely walking by the bushes. Upkeep with azaleas can also be time consuming and with all this combined, we decided it was best to remove them. Once removed I fell in love with all the natural stone removed and dreamed of having a flower garden one day. Reality now steps in. My name is Crystal and I have a confession to make.....I am the original Farmer Black thumb. I have been killing innocent plants for the past decade. When I walk into Lowe's plants shake and actually push other plants in front of them to be purchased. I read books, ask advice, and I have even joined gardening forums and to no avail, I still manage to kill nearly everything I plant. This year I was bitten by the gardening bug, yet again. So, imagine to my good fortune when I found some lovely statues in the trash down the street from our home. Although they were a bit faded and dirty, I saw some really great potential and for FREE, you could not beat that deal! Barry, the girls, and I stopped to pick them up. Once home I got to work on a garden challenge. 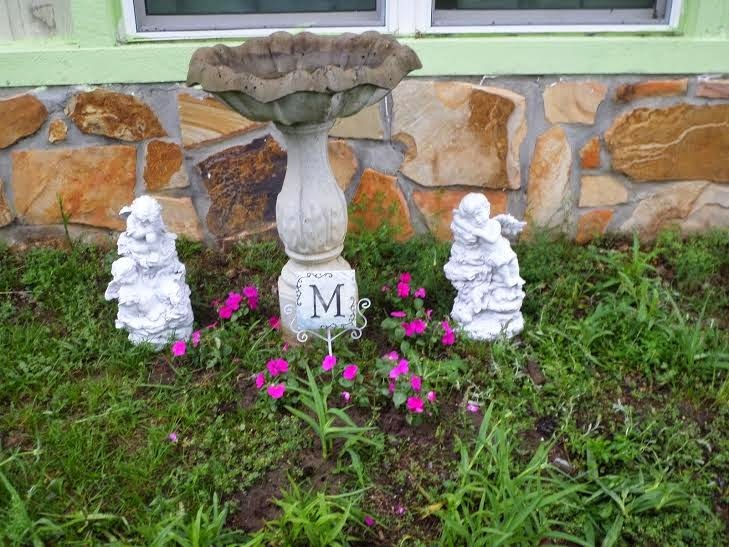 These motivated me to invest the time and a little budget into giving our garden a frugal makeover. 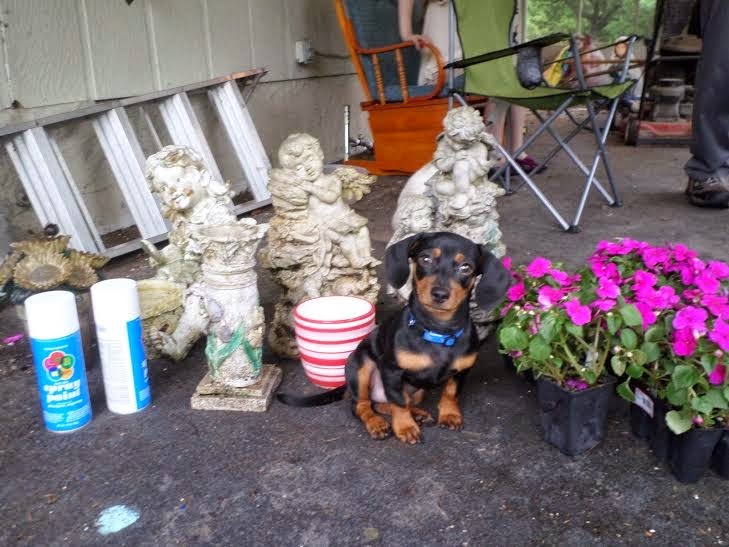 My lovely assistant, Nero, helped me set up things up on our back porch. 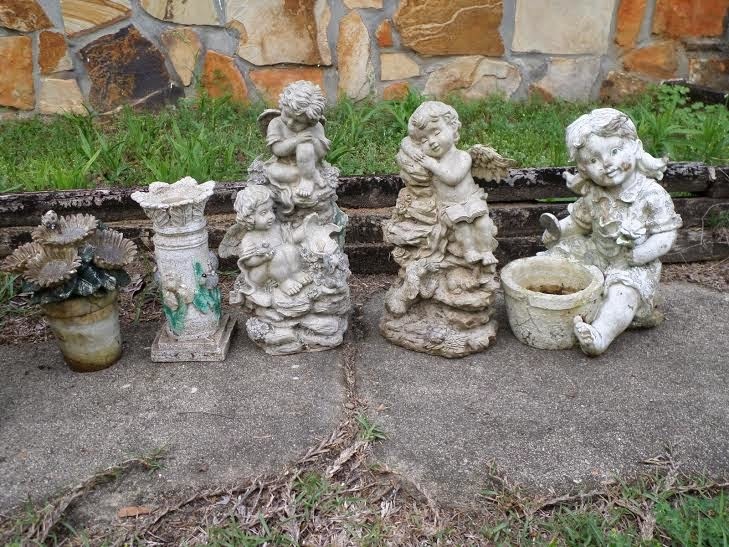 Garden statues: Free in trash. 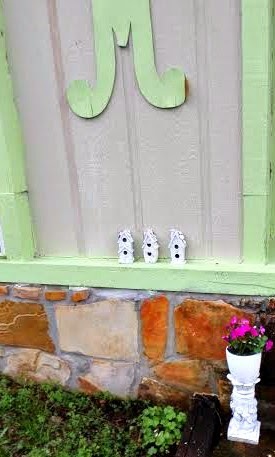 Spray paint in flat white from Walmart: .96. Potted plant holder: Free. This was from a Valentine's day gift Barry gave me many years ago. Frozen flag: Free. We already had it, but we did purchase it from Dollar general last year for 1.50. Monogrammed M sign: Free. It's another item we already had and we purchased it from Kirklands years ago. Potting soil: 1.00 from the Dollar Tree. Had it left over from another project. First, I gave all items a good scrubbing. Second, I just spray painted each item. I actually like the shabby chic type look. Flat white just seems to make things seem so refreshed, renewed, and modern looking. All in all I absolutely LOVE our new garden! For under 10.00 if my black thumb starts to show again, I haven't lost a huge chunk of our Summer budget. It also makes me feel great knowing that we saved some items, that might otherwise ended up in a landfill, and upcycled them. We made them our own and with our own style. I'm also not as anxious if they get accidentally damaged in some way as well. From what I read annuals are a really great plant for beginner gardeners to start out with. They seem to thrive very well with little effort. I also like that our garden is a bit small and I do not feel so overwhelmed with upkeep. I feel like our home is more welcoming and inviting to visitors. I know I will be enjoying my view from my rocking chair, as I wait for the girls to get off the bus in the afternoons. The girls even commented that they feel so happy getting off the bus and seeing such a beautiful garden. Barry even added that when he comes from work it just seems so cheerful, even on a dreary and gloomy day like today. The purple just pops from all the white decor. 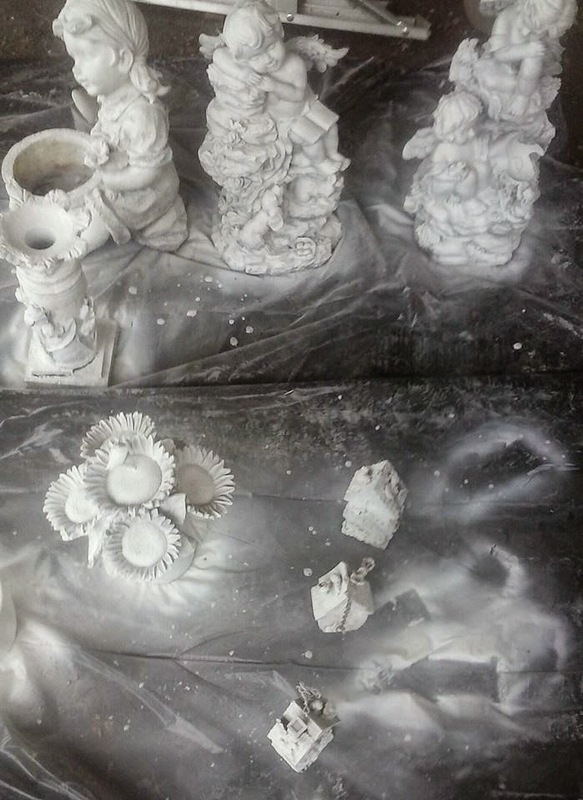 I know not everyone will be lucky enough stumble upon such great finds as these treasures, but think of the endless possibilities you can do with items you already have and just a can of spray paint. A few bright flowers planted and suddenly your front yard goes from drab to cheerful. This is what I challenge you to do this summer....take 10.00 and see what you can transform in your yard. 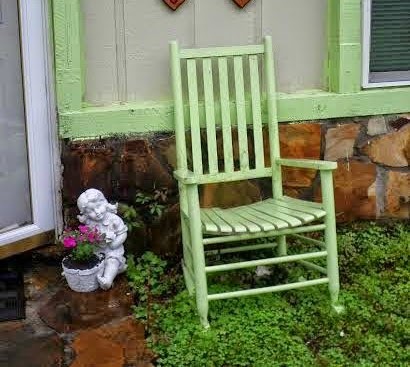 Do your own frugal garden makeover, I would love to see what you transformations.